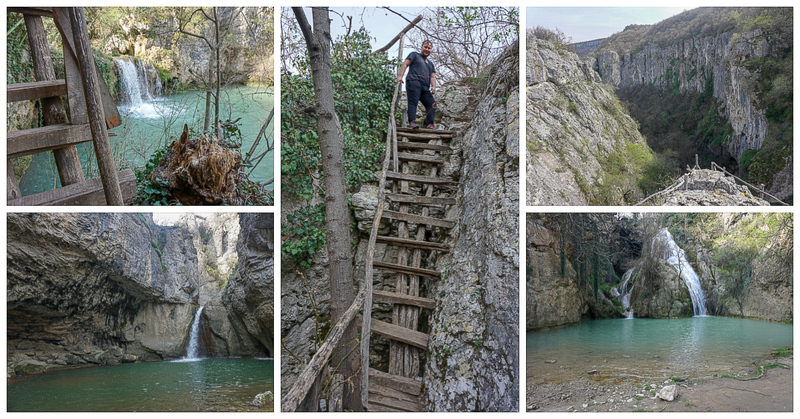 Hotnitsa Canyon – an adventurous 30-minute trail, equiped with ladders, bridges, insurance cables, that crosses the series of 4 waterfalls, reaching a plateau on which we descend back to the starting point. For this day-trip you will need – it is compulsory – mountain boots and a backpack with water and snacks for the day. We will acces both canyons on some short mountain paths that are quite easy to go through for any person that is familiar with fitness activities. Personal expenses in Bulgaria cand only be made in LEVA – you can find LEVA in Bucharest at some Exchange Offices in the central area or we can have a small stop at the border to change money. if you are unde the age of 18 – please contact your local embassy – there is more paper-work to do! We meet on Sunday, May 5th, at 06:00, in Piața Unirii – Union Square from Bucharest. As landmark, please come to Hotel Horoscop or The Harp Restaurant Terrace. There is also a Metro (subway) acces here, to Piața Unirii 1. Our coach (BUS) leaves at 06:10, not a minute later (I recommend arriving at 05:50 to choose your favorite seats). We arrive back to the same place in the evening around 21:00. To participate, please sign up by sending a private message to the page Arhiva de Geografie, or if you prefer by email, to the following address: geoarhiva@gmail.com – specifying the person’s name and the billing address. Thank you and let’s explore together the Bulgarian Canyons!